Tom Wolfe wrote his new novel, Back to Blood, entirely by hand. But the author of The Electric Kool-Aid Acid Test and The Bonfire of the Vanitiesalso says that wasn’t entirely by choice — he’d rather have used a typewriter. 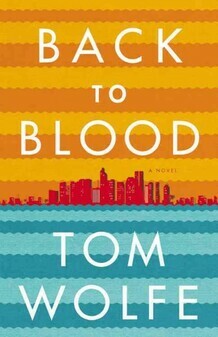 Back to Blood is set in Miami, which Wolfe describes as the only city where an immigrant community rose to dominate the political landscape in just over a generation. The novel deals with racial and ethnic conflict among the city’s diverse inhabitants, including immigrants from Cuba, Haiti and Russia, as well as the city’s long-established African-American and Anglo communities. Its central character, the young Cuban-American police officer Nestor Camacho, struggles with his identity and the ire of his community after safely bringing a Cuban refugee down from the top of a ship’s mast and arresting him before he could set foot on American soil. “If you touched anything that is connected to the U.S., like a bridge, then you were considered a ‘dry foot,’ but if you came in by water and you didn’t make it all the way in, you could be sent back,” Wolfe says. Wolfe is known for his association with the new journalism movement, which uses techniques of fiction, such as evocative scene descriptions and dialogue, to tell true stories. In writing Back to Blood — and for the first time — Wolfe allowed someone to follow him during his research. Oscar Corral, a former Miami Herald reporter, served as a tour guide and translator for Wolfe in Miami, and videotaped several trips. The result is a one-hour documentary called Tom Wolfe Gets Back to Blood, which is airing this month on some public TV stations.